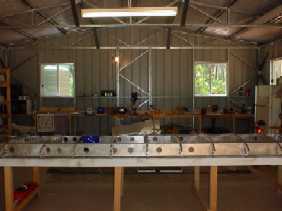 Set on 1 1/2 acres of bushland in sunny sub-tropical Queensland, Australia, the 12m x 7m x 2.7m shed from Titan is ready for the arrival of the BushCaddy R80 all metal ultralight kit from Canadian Light Aircraft Sales & Service (C.L.A.S.S. ), St-Fereol, Les Cedres, Quebec, Canada. With the aircraft kit clearing customs in Brisbane it was time for it to be delivered. 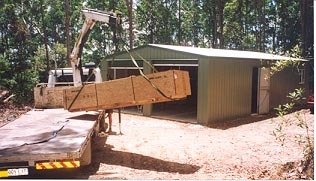 Due to its size, 3.6m x 1.2m x 1.07m and weight, 916Kg a crane truck was used to unload the wooden crate and push it into the shed. 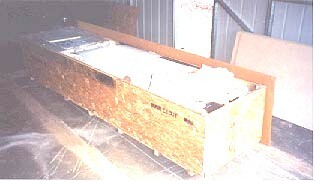 The crate is constructed of pine, very solid, and the timber will be used to build the shelves to store the parts. Everything is neatly packed and well secured against damage. There are two lists used to check the contents. 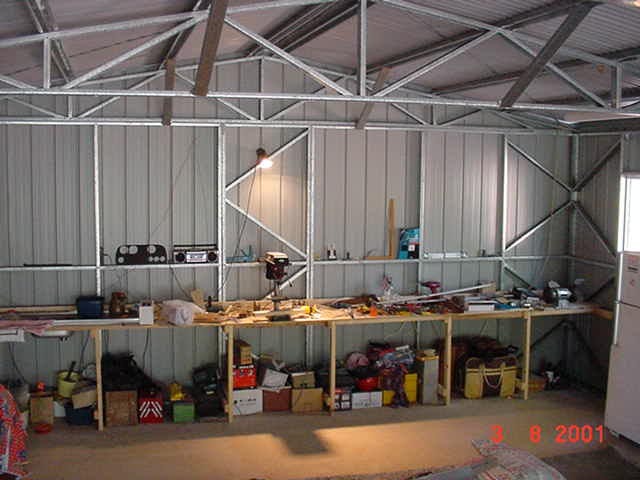 You can make use of the timber and the screws to build shelves to store all the components. After checking off the two lists and verifying the components, the owner is required to sign and return a copy within 30 days of receipt of the kit. Make sure you check every space in the container as some parts can be found packed inside others. 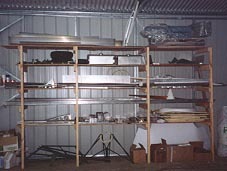 One of the most important time saving tips I can share when building an aircraft from a kit, is to construct enough shelf space to store all the parts instead of having them in boxes or piled up in a corner. The drawings for the BushCaddy R80 kit has a parts list divided into a number of section. Keeping the related components together on one shelf really makes it easy to locate when carrying out the construction and will save hours of lost time searching for that small part. A good long solid workbench with vice, electric bench drill press and bench grinder are essential requirements when working on long lengths of angle and since there are many components that require setting out and drilling, the bench drill press is an excellent purchase. A job is easier to do when one has the right tools and plenty of work space. With the bench drill centre of the workbench, it is handy as a rest for the vice, or with long lenghts of plate and angle there is plenty of room. One of these days I will get two extra windows put in behind the workbench to let in the breeze and natural light. Australian summers get very hot and this year is no exception as temperatures have been around 36C outside and 40C+ inside with little ventilation inside the workshop as there was only one window. While this was good for weight reduction, it did little for pleasant working conditions so time to install two more windows at the far end of the workshop to allow the breeze to flow through and also give additional light over the workbend area. What a difference this has made to my working conditions, should have installed them when the shed was constructed.